Multiplayer solitaire is a word that terrifies me. My general thought is “why play a game if I’m not interacting with people?” but I find myself coming back to those kinds of games. I love Race For the Galaxy. I love Dominion and it’s countless expansions. Core Worlds takes both of those and combines them to perfection. Sometimes it’s just nice to not be in competition. Sometimes it’s relaxing and fun to do your own thing. Sometimes I want to play a game that lets me build my perfect world, free of disasters or interference; a game where I can watch my people grow and prosper, where my civilization can blossom and reap the rewards of their hard work. When I want a game like that, I want Progress: Evolution of Technology. If you’ve ever played any civilization-building video game or even a lot of boardgames, you know that as your civilization advances you need to decide what they specialize in. For example, at some point you will have to decide between war and science. You can do both and never go far in either, or you can specialize and push farther up the tech tree. Progress takes this idea and distills it down wonderfully into an intuitive game that’s somewhere between full-blown Euro and gateway game. The entire game is driven by the Technology cards. These cards are divided into three Ages simulating historical periods. The game starts with Age 1 and ends after Age 3. Some cards have an Age icon on them. When the required number are brought into play (this varies by player count), the game moves to the next Age. When this happens in Age 3, the game ends. At the start of the game, a player has two actions on their turn. You can Discover a technology to put it directly into play. Instead of Discovering, you can Research a card as long as you are under your Technologies in Development limit. You play the card down with tokens equal to your Research skill. In addition, you have the Quick Draw action which lets you pull from either a deck or discard pile, a Shuffle & Draw action which lets you shuffle up one or more Age decks and then draw a card, and the Draw action which gives you three cards and ends your turn. Your player board at the beginning of the game. One of the key aspects to Progress is that all of these skills can be increased by playing Technology cards. Every card has some benefit that it gives when played and sometimes this will be increasing one of these skills. While Progress starts out slow, the game ramps up very quickly when you get more Actions. The ability to have multiple Technologies in Development is huge because of the cost savings. Putting less cubes on your Technologies by increasing your Research skill makes it even more powerful. Increasing your Quick Draw ability gives you flexibility in drawing cards. The ability to tailor your options to match your play style and strategy is a very unique aspect. It seems like a lot to manage at first, but the player aid that tracks these things makes it effortless and turns it into one of the game’s highlights. There’s not much else out there that gives you that sort of gameplay variety. What your player board may look like by the end of the game. Discovering a new Technology is the most direct way of getting them into play. To Discover a Technology, you have to pay any costs listed on the card. Costs will be a number and a symbol, follow by a slash and then a card name. There may be 1 or 2 costs depending on the card. If you have the named card in your tableau, the cost associated is nullified. If you don’t have the card, you will have to pay the cost either with cards from your hand or with Knowledge tokens you get during the game. That’s right, you not only play cards to build your civilization but you also use these same cards to pay for other cards. I absolutely love the hand management required to balance your options. It creates a steady stream of small decisions that really add up. Combine that with the tech tree concept and you have some great decision points. Do I go towards Agriculture or do I go the other side towards Culture? Those add up as you proceed in the game. There’s another option should you not want to part with your precious cards, but this option costs Time: Research. You start the game being able to have one Technology under Development and your Research skill starts at 4. 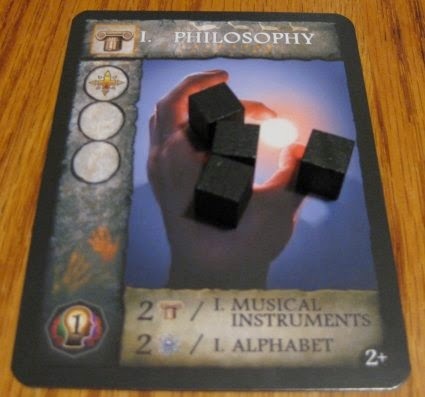 In lieu of Discovering, you can play that card as a Technology Under Development with Research tokens on it. 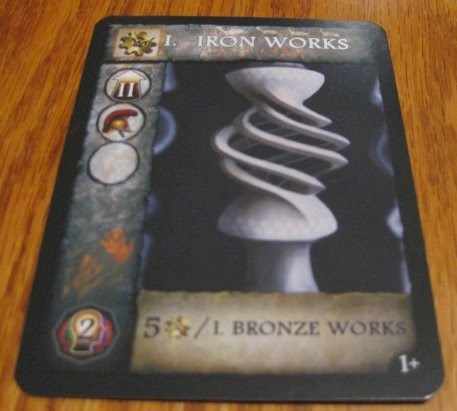 Each turn, a Research token comes off with the card going directly into play when the last one comes off. This gets you around any costs for that card and allows you to sort of jump around the tech trees. However, the cost is time so you need to balance that out. Additionally, to really maximize this power you need to spend time getting cards to increase our Research and Technology under Research skills. This may put you behind in the early game, but it can yield huge benefits if the game goes long enough. That’s another decision layer added to the game and one that I find this to be really interesting. In most games with a tech tree, you have to go one way and commit to it. Progress offers you the ability to change courses somewhat. You're never stuck staying with your tree. You can build any Technology you can afford and that's one of key factors in this game. Sometimes you start off one way and then get cards that support moving to a different tree. The trick is knowing when you should and managing your resources to support the move. It's a balancing act for sure, but one that rewards good play and doesn't punish anyone for getting bad card draws. Calling this game multiplayer solitaire isn’t quite fair because there is some interaction. The Power Board is set in the middle of the table and features three tracks: Prestige, Population, and Army. Some Technology cards feature these icons so when you put one of those into play, you increase your marker on the associated track. These tracks are worth a lot of points at the end of the game so you need to pay attention to them. In fact, if you don’t win any your odds of winning are very slim. I learned this the hard way and made sure to not forget that in subsequent games. Here's what the Power Board may look like in a 3-player game. You can see the payouts on the right. In this situation, Red is clearly dominating on points followed by Blue and then yellow. I mentioned earlier about moving through the Ages and ending the game and this also supports the player interaction. It’s possible for one or more players to play a cautious game, proceeding slowly while another player tries to push towards the end quickly. You will see interaction between the players as they try to pace the game to suit their needs. When Age 3 starts, all cards from Age 1 that are not in play (cards from your hand and Technologies under Development) are discarded. One intrepid player pushing far ahead could ruin the hard work of others with that ploy. Again, it’s indirect, but it’s not as if there’s no interaction at all. It feels like the player count on this game is best with 3. That’s the right amount to get competition on the Power Board without causing excessive downtime. The sheer number of options for tech tree advancement can cause some AP so I feel like the game bogs down at higher counts. With two or 3 players, it moves at a good pace and still has plenty of competition. In fact, I’d say this makes a wonderful game for couples due to the solitaire nature. As an added bonus, I feel like this could be a most excellent gateway game to the next tier of games. Once you get past Catan, Ticket to Ride, and Carc, there’s a bit of a void. Progress will fit incredibly well in that void, giving a nice step up in complexity and introducing players to Euroglyphics. There aren’t too many symbols and the ones that are there are very clear as to their use. 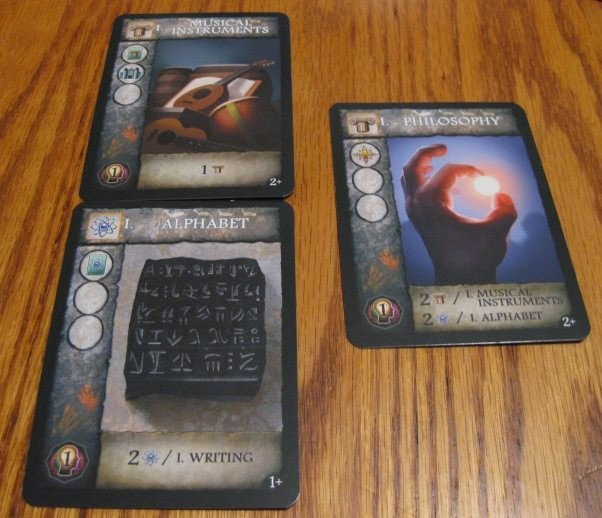 There’s really no gateway games that offer Euroglyphics 101 so this would work incredibly well to teach that concept. If you are looking for a step-up towards games like Race For the Galaxy, this is your best bet. I do appreciate the addition of a couple add-on modules and feel that they really help the gameplay. I’m a big fan of the Personalities as these help move each player towards different play styles. The fact that these can be changed mid-game is a nice plus. I love the Heritage powers on these cards because it offers yet one more decision layer. The Milestones help with player interaction by giving everyone a common goal to work on. If you want a longer game, just add in the Age 4 cards which take you right up to modern day. One of the best aspects of Progress is the wonderful graphic design and artwork. There are few games presented as well as Progress. It’s incredibly well thought out and really helps make the gameplay easier. Many games look nice. Others are laid out well. Progress is a work of art in the form-meets-function category, marrying those concepts perfectly. The rulebook is also wonderfully clear making the game playable right out of the box. Huge kudos to whoever was responsible for the presentation. If I had to pick something I don't like, it's that all cards can be played with General Knowledge. While costs have specific types, you don't need to have that type to play the card. I do wish the costs actually required specific types of Knowledge to play. That would certainly complicate things, but it would ratchet the resource management aspect up several notches. If they ever do an expansion, I'd love to see more cards offering specific types of Knowledge. So maybe I do like multi-player solitaire games after all. I certainly like Progress. It has a lot of small decisions that combine to create your strategy for the game. You may not realize it but from turn 1 you are shaping how your game will play out. There’s opportunities to course correct along the way so you’re not stuck, but maximizing your strategy will pay dividends. Progress offers a wonderful experience for seasoned and new gamers alike, providing common ground that should please everyone. I’ll always be a guy who likes player interaction in my games. Honestly, I want to be able to mess your stuff up and laugh when things go horribly wrong for me. But there are also times I want to watch my imaginary civilization prosper. There are days I want to build that tech tree and revel in my technological marvels. On those days, I want something where I can steer my people to glory and not be messed with. On those days, I’m reaching for Progress: Evolution of Technology.